Hello everyone! Finally, we are DONE with the first semester of the second year in pharmacy school, supposedly the hardest semester! Wah hoo!!! Time to rest up for a few weeks, catch up on my life, work on some volunteer work with my church and youth group, and start my brainstorming for Pharmacy Day 2012! But first, I wanted to take a few moments to share my personal testimony with you guys. As a child, I’ve had a hunch that my future would consist of helping people. Throughout high school and early college years, many careers caught my interest. Perhaps my future would include being a Priest, a teacher, a nurse, or even a pharmacist. No matter what I chose, one consistent theme was present – I wanted a career that would allow me to have a positive impact on the lives of others. During first few years in college, I took some time off to explore my vocational calling at two different seminaries. Those three years gave me the opportunity to visit with the elderly at nursing homes, participate in the March for Life and assist the seminary health team. Through those experiences, I had time to reflect about the possibility of a career in the health/medical field. When I returned to Minnesota from the seminary, I was a bit lost and did not know where to go from here. I was falling behind on my college education, 3 years to be exact, since we had different requirements at the seminary and to be honest, I felt a little heartbroken from the attempts at the seminary. Nonetheless I went back to college, North Hennepin Community College, and started taking all the required prerequitesites to God knows where, but I kept on taking them. 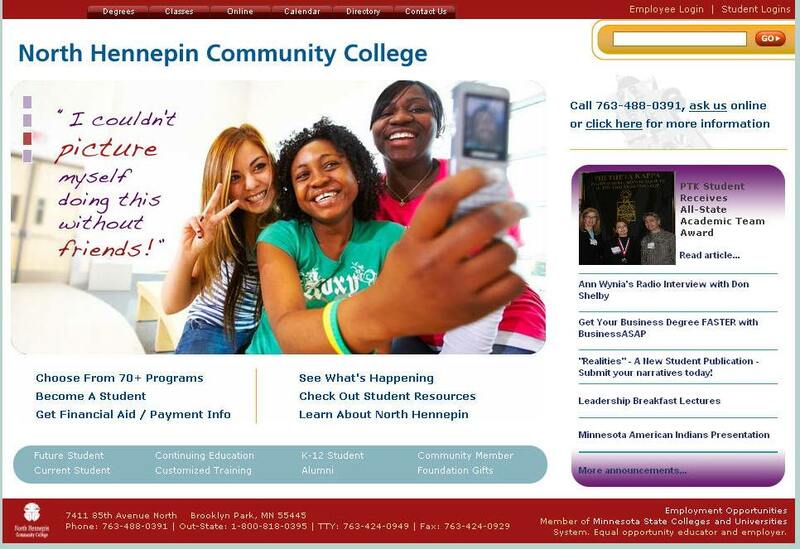 I was became interest once again in the health professions, in particularly the nursing field, since North Hennepin Community College nursing program was growing. During that time, I also started to be involved with volunteering at my church through teaching Vietnamese & Catholic Catechism, helping out with the children’s choir and with our local youth group chapter of the Eucharistic Youth Society every weekend. It was during those volunteering times that I talked to other youth group leaders about my education journey and one of them, a University of Minnesota College of Pharmacy graduate, told me to apply for a pharmacy technician position at Walgreens. 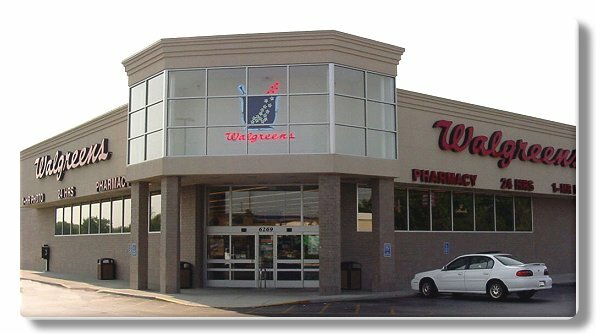 Through her help, I was hired to work at a brand new pharmacy near my house. I had contemplated a career in pharmacy, but I did not foresee a permanent commitment to the field because I did not think I was smart enough and that I am way too behind on my education to get in and so I never really tried. To my surprise, however, I felt right at home. My first night, I was introduced to challenges like insurance difficulties and hard to read scripts. I began the arduous task of learning a new sig language. I immediately recognized the need to ‘armor’ myself for the battle. I studied my sig codes, proper insurance handling, and became familiar with the most commonly filled prescriptions. After six months, I took the exam and became a certified pharmacy technician. Two months later, I was promoted to Senior Certified Pharmacy Technician, a position that is generally only afforded to employees with at least two years of employment. I immediately was entrusted with management of technicians, scheduling, training of new technicians, and even created an insurance help sheet for my entire district. With that came a new boost of confidence and I told myself that I will try to get into pharmacy school. I took the PCAT in June of 2009 and applied to only one school, the University of Minnesota. Unfortunately I was declined from even an interview. I was quite disappointed but I knew that my application was not the best and I was determined to make it better within one year. I applied to get into the Biochemistry & Biotechnology BS degree program with Moorehead State University at the North Hennepin Community College campus and continued my education journey towards my BA degree. During that time, I continued with all of my volunteering work at church and with the youth group on a Regional and National level. I worked hard to prepare my personal statement and application and asked classmates and friends that work in journalism to help edit. I was still not entirely confident since I was declined the previous year and so my hope was to just have an interview with the UofMN. I also applied to Wingate University, relatively new pharmacy school in NC, and Creighton in NE. I submitted my application early January, for those of you guys reading this is pretty late so learn from my experience and turn it in earlier. My sister also submitted her application in December. I was extremely happy when she got an interview with the UofMN. I remember praying that even if just one of us gets in, that is enough. So 3 weeks gone by and still I haven’t heard anything from the U. I was sad but I prayed that if it be the will of God, then that is okay. I got an invitation to interview the first week of February. I was ecstatic! This was what I had hoped for this year and if I don’t get in, then I can gain some experience from this and get in next year after I finished my BS. Little did I know what God had in store for me. 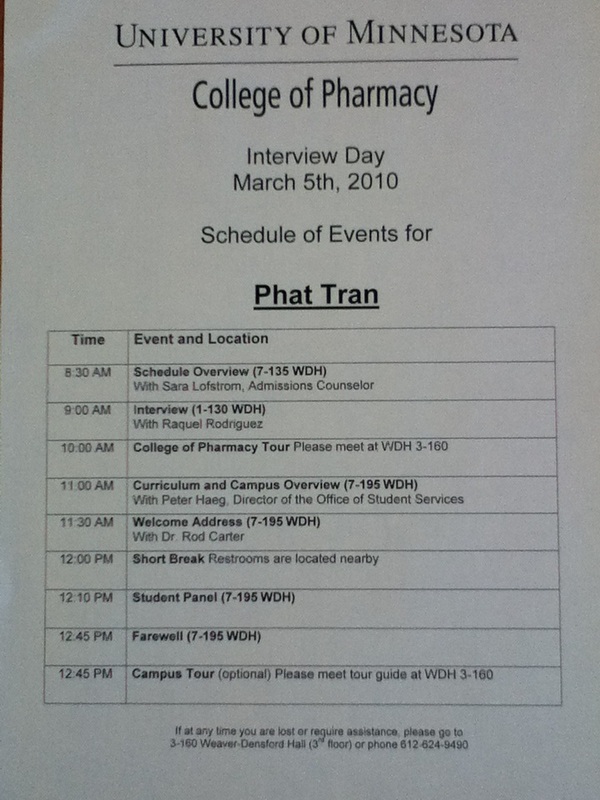 I went to the interview on March 5th. I was quite nervous but my sister, who had already gone to her interview in February, coached me on the process. This was quite comforting, yet I know every interviewer is different. I took some friend’s advice and also visited studentdoctor.net to prepare myself for the interview. The interview went just fine and I had an awesome interviewer, however, it is now March and the available seats are filling up fast. After interviewing at the U, I was curious why the other two schools did not call me and so I decided to call them instead. One turned me down and the other wanted me to retake the PCAT since it was not high enough for their standard? I was so surprised since I always thought that my score was okay since I got an interview with the University of Minnesota, which ranks number 3 nationally. I dug through all of my papers for my PCAT score and they were right, my PCAT ranking was pretty low, definitely lower than the average of the incoming class at that time. At the discovery of this news, my heart sank. 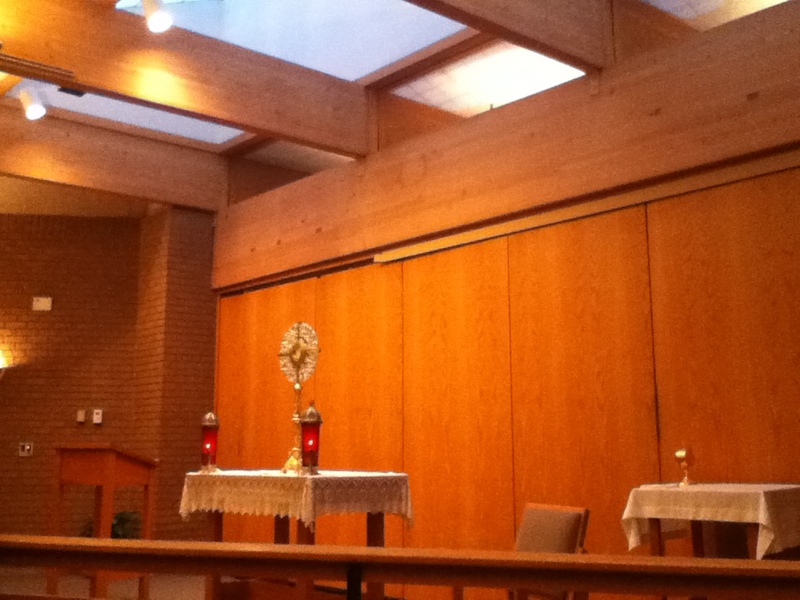 I remembered swinging by Perpetual Adoration Chapel that night on my way to work and fell to my knees and prayed. “God, I know that I probably will not be able to make it into pharmacy school this year. I know that my sister has been working very hard to get in so even if only one of us can get in, let it be her. I am fine with that. Please stay with me and give me comfort, strength, and perseverance to bypass one more rejection and keep on applying next year…” Those words always ring in my ear as I drive by St. Vincent de Paul Catholic Church to this very day. But like I mentioned previously, God has a plan. A few weeks later my sister got her acceptance letter and I got my wait list letter. I was placed on the ranked wait list with no numbers as they still have 2 more interview dates after mine. Still, I was quite happy with the outcome. On a Friday in April, I came home after classes and decided to check my email one more time before the weekend. 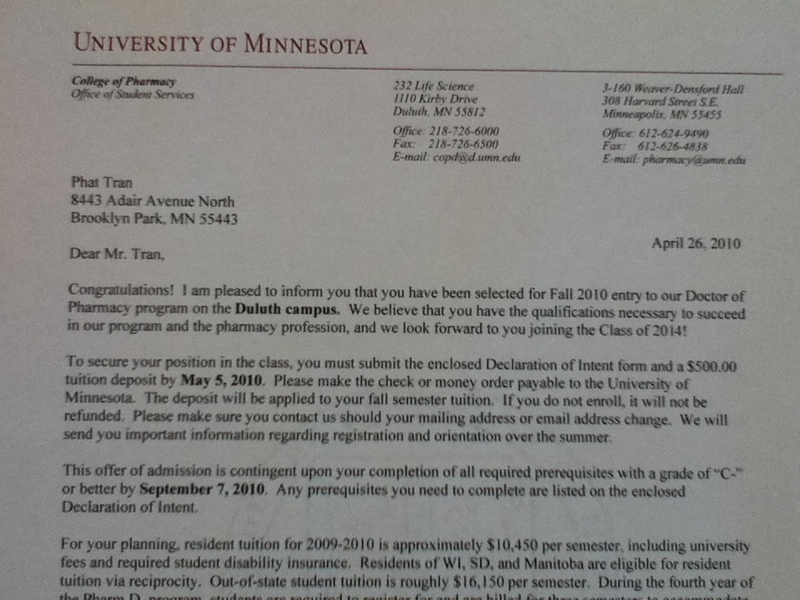 I received an email from the University of Minnesota stating that I have been offered admission to the Duluth campus!!! I think I read that email at least 3 times and started to say, “Oh my….” to the rest of my family. I was in shock and wanted my family to confirm that it is a legit email, that it was addressed to me, that it’s from the College of Pharmacy and it was!!! Praise the Lord!! 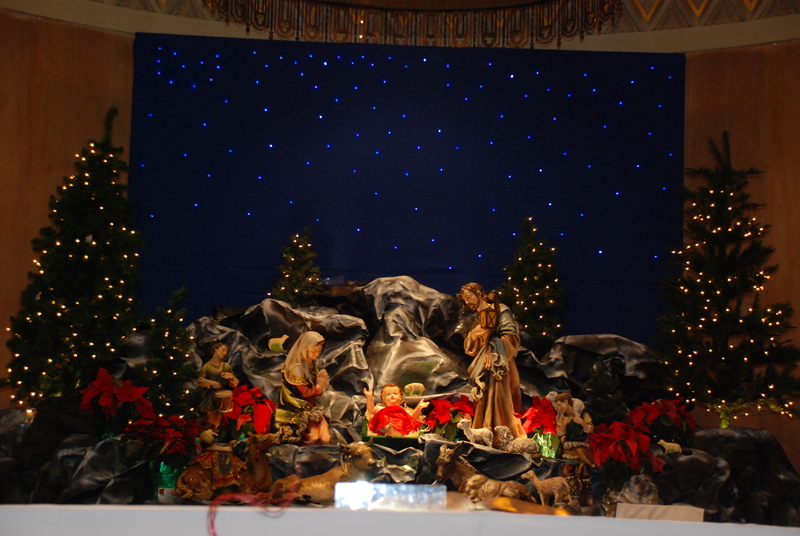 The whole family was so happy, we jumped around the house smiling and thanking God, and finally we bundled up and went to Mass that night to thank God for this amazing miracle. The both of us got in!!! Now the only negative was that I was accepted into the Duluth campus while my sister was accepted into the Twin Cities campus. While my main preference was Twin Cities, there were no more seats available. We would be in the same class, attending classes with each other via ITV (kind of like Skype) and would graduate together but we will be separated by campus. Though it was not ideally what we had hoped for, I was very happy about the outcome and did not ask for more but little did I know what God has planned for us. During the summer, I went up to Duluth and looked for housing and toured the College of Pharmacy up there. I found a very nice house with nice roommates about 6 blocks away from school. I was in the midst of signing the lease when a huge family event broke out. I was so lost and devastated by it. I did not know what to do and if I should proceed on with pharmacy school in the fall in Duluth. I am the oldest of the family and I felt that it was my duty to stay home and helped them cope and get through this heartbreak and so I submitted my Application for a Campus Transfer and declined the lease to the house. I knew that I did the right thing to fulfill my duty as the oldest brother but even if they accepted my campus transfer, it doesn’t mean that I will be able to go to pharmacy school in the Twin Cities unless a spot opens up. Though I was very sad about this uncertainty, I trusted that God has a plan for me. In the middle of July, I received a phone call from Sarah from the College of Pharmacy telling me that a spot had opened up in the Twin Cities. I remember running to the back of the pharmacy and fell to my knees and thanking God! I now have the opportunity to go to school in the Twin Cities, while staying at home to help my family, and get to share this Pharmacy school education journey with my sister! God has a plan for me to get into pharmacy school regardless of me having no degrees, I was one year away from my BS in Biochemistry, with a pretty good GPA, lower than average PCAT ranking, and no undergrad research or publication. He planned out other ways to help improve my application by working for Him at church, getting a wonderful pharmacy technician job and the promotion though church friends, and helping with the Eucharistic Youth Society and it is through these things that I gave complete credits of how I got into pharmacy school. In addition, I think the Admission Committee here at the University of Minnesota tries to find a well rounded person and not just based on book smart and high PCAT scores no bias of course 🙂 My sister, who is on the Admission Committee this year, told me that they look for a person that can endure the tough course load, who is committed to the profession, who will give back and contribute to help out the community, and who will be a great future pharmacists! I still can’t believe I am attending the 3rd best pharmacy school in the nation! God works in amazing ways! “Your love, O LORD, reaches to the heavens, your faithfulness to the skies.” Psalm 36:5. PS. As always, if you’ve enjoyed this like us and our blog and if you wanted to get updates on our adventures here in pharmacy school, click on ‘Follow’. 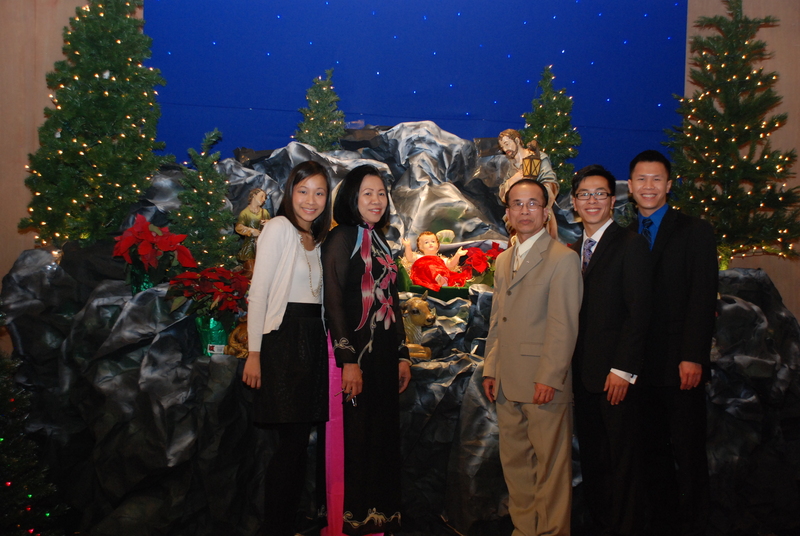 My family with baby Jesus in our church, Christmas 2011. Hi Phat and Kim. This is Haley N. (from PNC). Miraculously I ended up on your page after browsing around, and have spent the last hour or so reading your blogs. Thank you so much for taking the time out of your busy life to do this. I found this post to be especially inspiring. The road that led you to pharmacy school sure was a tough one to take and I am glad that you did not give up and was persistent in pursuing something you were really passionate about. I will send this link to my friends (who are applying to pharmacy school this year), hopefully they will be as inspired as I did. Congrats on finishing the hardest semester of your PharmD program, and enjoy the rest of your break. Hopefully I will see the two of you at the clinic sometimes next semester. Happy new year!! Thanks and glad you enjoyed it Haley! Our hope is that people will be interested in the pharmacy profession and know that they too may be able to get in if they put forth their best effort (with a little help from above of course). Like I always tell the kids at my church, “if I can make it into pharmacy school then you can too!” 🙂 If your friends ever have any question about pharmacy school and wanted to know it from a student perspective, feel free to let us know. See you around school and PNC! I happen to see Haley’s link and swing by here. Thank you for sharing your amazing story and glorify God on top of all. It is also a patient’s blessing to have caring pharmacists like you two. My GPA dropped from a 3.9 to a 3.0. I only have a few more pre-reqs to take and I’m done. I’m applying to take a PCAT next year. I am working part-time at a Nail Salon, on weekends. I am planning to re-take a few classes to bring up my GPA and start volunteering at hospitals soon. What do you guys suggest me to do? Should I re-take classes or take other easy classes instead to bring up my GPA? Please reply asap. Thank you so much for your time. 70% composite PCAT – NEW! If you have any other questions, feel free to let us know. Best of luck and hope to see you in our profession in the near future! Thank you for sharing your amazing story. I’m inspired after reading it. I’m currently a pre-pharmacy student and going to apply to Pharmacy School this year. I’m struggling on how to write a good personal statement. Would you please take your time and help me? May I have your e-mail address so I can contact you directly? My e-mail is pharmrx1122@gmail.com. Thank you so much for your help. I am accurate student at the university of cincinnati.I plan on applying to University of minnesota college of pharmacy.However I have being on my feet to make sure I fulfil all necessary criteria which is very essential to boost my chances of getting accepted into the college.I have a CGPA of 3.5 and science GPA of 3.65 .I have gain experience in the field through volunteering at a pharmacy.In addition ,I have gain experience both in leadership skills and also play an active role in several organisations both on campus and outside.I have about 129 semester credits currently but my problem which is placing my admission in jeopardize is my PCAT. Only GOd knows how hard n sleepless night I have been through , however I am not able to raise my PCAT score.I have taken it twice and it’s not anything close at all.My current score is 16 percentile.Problem which constitute to my down fall is that I am from Africa and we are not use to standard exams therefore it becomes very very challenging when it comes to standard test due to slow writing , typing and being able to read on a fast pace.PLEASE I NEED ADVICE..DO you think I should go ahead and apply with my credentials eventhough my PCAT is not able to prove what is reflecting on my academic transcripts. I was browsing the web looking for help on Pharmacy interviews and I came to yours. Thank you for your story, its really inspiring! I have a pharmacy interview coming up soon and am very nervous. Im scared that I may answer a question wrong or they might not like my answer. I also have pretty bad anxiety which will make my experience even worse. Can you give me some tips for interviewing and answering questions please? I really want to get in. Thank you for reading our blog. With regards to interviewing and answering questions, take a look at one of my previous responses. You can check out some questions on a blog called the ‘Student Doctor network’ (just Google it). This is a blog from previous students who interviewed at different schools and they’ll put the questions asked and their responses/experience on there. Keep in mind that these are more personal responses so don’t based all your preparations on them. While the thoughts of interviewing is very scary and intimidating, keep in mind that you are also gaging to see if this is the right school for you too. They know that everyone will be nervous during the interview. I would say that be up front and honest about it cause they’ll usually start the conversation by saying, “How are you doing? How’s everything? etc” so you can respond by saying that you are nervous and that you have some bad anxiety about the interview…however, you know that this is a weak point and something you’re willing to work to improve if you were given a chance to interview. Ultimately, you will excel at this skill and help your future patients! So turn your weakness into an area you’ve recognized and willing to work hard to improve it. Does that make sense? If you have any other questions, feel free to email us at tranx270@umn.edu. Thank you very much for posting your story. It was such a wonderful and inspiring story I’m currently applying to pharmacy school for Fall 2014. I’ve been working hard to have a good GPA and a compatible Pcat score. I really hope that the University of Minnesota college of pharmacy will give me a chance to interview. I do believe that a that faith of a “mustard seed” can move a mountain and I will keep praying. However I’m curious about the PCAT score, do I have to be 70 or above to have an interview? What was yours ( if you don’t mind)… I scored high in chemistry, biology and math, but very low in reading and verbal. I know that there are many aspects that the admission committee will look at but I’m very nervous. Thank you for reading our blog. No you do not have to have a PCAT score >70 for an interview. The admission committee looks at the overall candidate with about 12 different criteria so even if you have a low PCAT score, it doesn’t matter that much. My PCAT ranking was less than the 50th percentile but my score was not that bad. I had the same weaknesses as you with lower scores in reading and verbal. It’s something that I know I need to work on and I mentioned that during my interview as well. I think honesty works a long way and so just recognizing your weaknesses, and then mention ways or plans to work hard to improve them. Good luck on everything and yes faith can move mountains! Wish you all the very best. I am so interested by your blog. it is so helpful to read. I plan to apply to a pharmacy college in 2015 class. my GPA is 4.0 until now. I have not taken a PCAT exam. i plan to take one during this summer. however, I have just live in the united states for 6 years, and my English is not very good. I don’t know if it is a weak point during the interview? also, I heard that many school will look at the transcript to see how many classes you take every semester. you will have more chance if you are a full time student and take at least 15 credits hours/semester. Is it true? every semester I just take 11 credits hours because I also have to work and take care for my family. I don’t know if it is another weak point that they may look at during looking at my application. Please give me some advice and thank you very much for posting this useful blog. I understand your fear about English but I do have classmates that has just came to the US for only 3-4 years and they managed just fine. With hard work and determination, one can achieve anything they set their mind to. It may come off as a weak point but you can always turn that into a positive by informing the interviewer your situation and how hard you have tried and is going to continue to try to improve your English skills. Regarding class work load, they would prefer that you can take full time classes and be able to to still have good grades as that may give them a glimpse into your future in pharmacy school. For some semester, we had to take 18-21 credits depending on electives! However, everyone has their own story and I am sure they will understand your situation, just make sure to say something about that in your personal statement but that you know you can manage and survive the workload once you enter into pharmacy school. Perhaps if you can, do one semester full time (13+ credits) and see for yourself if you can manage it even with your hectic family schedule. Good luck with everything! I know how that must have felt but keep on going! As I’ve always been sharing with others, miracles do happen and that’s why I wanted to share my story in hope of inspiring and motivating others. Best of luck and feel free to let us know if you have any questions about the application process. God didn’t have anything to do with it. Your hard work and perseverance did. Good read and thanks for putting your self out there. It’s exciting to know that the strong will persevere. I’ve read this post twice and I cry every time. I am very happy that you got into Pharmacy school and are probably now practicing. I’m a first year college student and I’m very nervous about applying to pharmacy school; it is my dream to work as a pharmacist, but my grades are on the low edge, I failed my college precalc course (which I will be retaking in the summer) I made a B’s in my biology and History pharmacy prereq courses and I have withdrawn from Gen chem twice,(which does not factor in my GPA but I’m sure I’ll be asked about it). I’m so nervous and scared and anxious to apply I cry because i’m so anxious. I really hope my prayers are heard and I get accepted into a pharmacy school. I really enjoyed reading your post, and it touched my heart. I recently applied to pharmacy schools for Fall 2018 admission. I interviewed at the University of Minnesota last month, and I received an email recently that I was put on the ranked waitlist and that I will be notified of my ranking in mid-may. I feel really lost and defeated as U of M is my top choice. I really hope and pray to god that I get accepted to the U of M.
Hello! Thank you for reading our blog and congratulations to you on your interview! I know it’s a little hard to celebrate but having an in person interview really says something about you and your application. There are so many criteria that the Admission committee looks at prior to offering an interview so be proud of yourself for that. While it’s not your ideal outcome/path to be on the ranked wait list but you never know…just don’t give up. I remembered that they went through 40+ people on the ranked wait list during my year. Just keep up the hope, keep on trying, and remember to pray. Never know what God has planned for your. Feel free to email me at tranx270@umn.edu if you have any other questions that I can help with or if you’re looking for hospital pharmacy experience. Hope to hear some great news from you soon! Best of luck!